A few weeks ago, I used this word to define how I was feeling: weary. I have never (at least as far as I can remember) ever used that word to describe myself before. Weary feels sad to me. It feels defeated. It feels worn out. I realized that there are, likely, others who’ve felt exactly the same way. Yesterday morning—after the third consecutive night of sleeplessness and bad dreams (some of them downright nightmares)—I was given this very succinct message in my exhaustion: “shine a light”. It wasn’t a burgeoning idea that I planted in my mind. It was something that was being told to me, and it was extremely simple, and clear, in its complexity. A couple of hours later, I walked upstairs to the guest room and decided I’d try to sleep for just one hour before I had to hit the road. I thought that maybe “a change of scenery” would help. I dozed off for less than 30 minutes but clearly saw the same message: “shine a light”. The format was different—there were images of a being (whose face kept changing into different ethnicities) that I clearly knew was Jesus. This being was holding light—not something tangible like a flashlight or a candle or a burning torch—simply light. Okay….message again understood. But what kind of light could I possibly shine? I still have not “processed” enough to know exactly how to “shine a light”, but I figured that my journey of being real, honest and open about where I’m falling down, might just be a good start. Following, are the kinds of questions I asked myself in my weariness, in my less-than-ness, in the dark. How do I live in the light—in the light of God’s abundance (because I do experience abundance)? n.b. These are questions that I wrote when I started putting paper to pen about this a few weeks ago. The irony is not at all lost on me that the first question I’d written has to do with light. How do I take the tough experiences I’ve had (of pain, of loss, of sadness) and channel them into something productive and positive so that I don’t experience weariness again? Why am I so impatient with myself? Walking through life with fellow journeyers is what I know to be one of my main purposes in this life. I honor, and am grateful for, the opportunities I have to “be there”—to offer a hand to hold, or a listening ear, or a shoulder to lean on. I want to be there; I want to make a difference. Am I not worth that too? What will motivate me—propel me forward—to live out the rest of my days, in this life, in a way that adds to the human footprint, rather than consumes humanity? 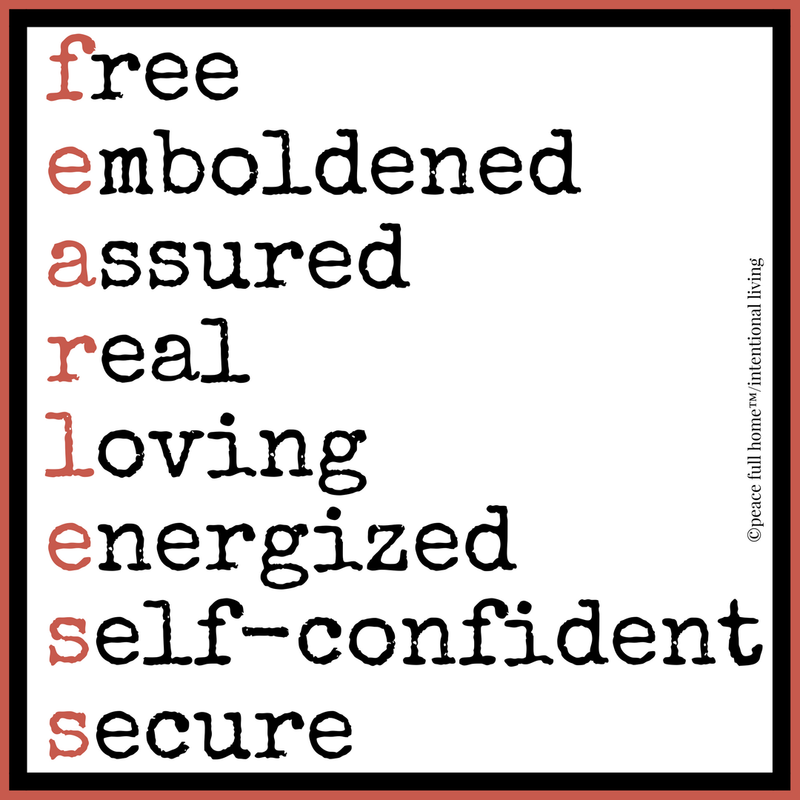 How do I become fearless—moving forward unafraid of being real, empowered to speak my truth even when it’s scary, being brave in spite of being weary? Are any of these questions that you’ve asked too? How often are you emboldened to make the changes that speak to who you are? When do you find life exhilarating? When are you walking on a path that “feels” right—where you are completely at peace, and in sync, with your heart’s desires? Sometimes, I’m subject to the mercurial whims that play only to the human brain part of myself. I forget who I am at the core and allow (maybe invite) less-than. So, I pray, often (sometimes continually) for the tenacity to grow. We have choices. We can live a life sullied by the pain of negative experiences. Or, we can be resolutely determined to be the best person that our spirit knows we are. I have a keen knowing that there is more, but sometimes I feel ill-equipped to change the tide. I stay anchored to the shoreline; afraid to wade out a little deeper. And so, my evolution continues…sometimes fearlessly moving forward in leaps and bounds, and sometimes baby-stepping all the way through a day. And, perhaps, that’s as it should be. Amen? This entry was posted in Living Intentionally, Peace Full Home and tagged experiences, fear, fearless, honesty, light, sharing, tenacity, vulnerability, weary. Bookmark the permalink. Great post. Good questions to ask myself also.